Now that August has arrived, the end of summer countdown has started for me. Even though school doesn’t officially start until the 18th, I’ll be in my classroom from here on out with meetings, prepping, and finally getting my new room put together. I guess it’s time to wrap up my endless days of leisurely reading. I am one sad booknerd. Nevertheless, if I must venture back into the classroom for a new school year, my love of summer reading won’t disappear. The first few weeks of school always still feel like summer to me anyway, especially with the usual Midwest humidity. It isn’t until the air shifts and the first days of Fall start that my own reading taste changes, but I’ll be talking more about that in the coming months when I relaunch my podcast! Until then, I thought I’d share a book list featuring my favorite summer YA reads. 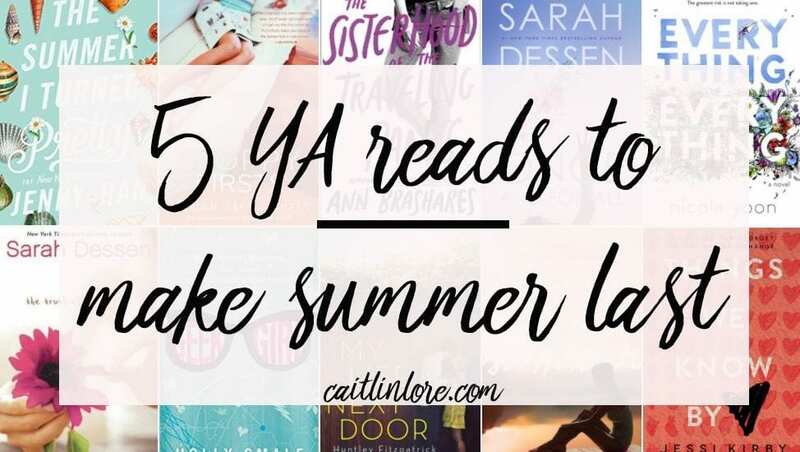 These books may be YA (young adult) but they are truly for anyone else who enjoys a good beach read, a little romance, and basking in summer for as long as you can! So, pack up your beach bag for one last week and join me in making summer last! The Queen of YA Romance is back this summer with a new book and it is fabulous! Synopsis: Louna, daughter of famed wedding planner Natalie Barrett, spends her summer helping brides plan their perfect day, but she stopped believing in happily-ever-after a long time go. When charming, serial-dater Ambrose waltzes into her life, Louna’s summer shapes up to be more than she imagined. Especially since she’s the one girl Ambrose wants. If you love weddings, star-crossed lovers, and perfect meet-cutes, this one is for you! I read this one a few summers ago, but it’s one that has stuck with me! ynopsis: When her boyfriend Trent dies and his heart is donated to someone else, Quinn Sullivan believes that if she can track that person down, she’ll still have a little bit of Trent left. Except, whoever received it is choosing to remain silent. Risking everything, Quinn goes outside the system to find it, but what happens to start as an accidental run-in with a boy, turns out to be so much more. And is Quinn falling for the new boy? Or the one she lost? If you love unexpected connections, emotional reads, and Sarah Dessen, pick this one up! Sweet, heartwarming, and first love. What could be better? ynopsis: The Garretts are everything that Samantha Reed’s family isn’t and for years she’s wished to be one of them. Until one evening when seventeen-year-old Jase climbs her terrace and everything changes as the two fall madly in love and she’s pulled into the family. But when her world shifts, and she has to make a decision, which family will she turn too? If you love family tales, first loves, and impossible decisions, this is for you! I’ve re-read this one over the years because it’s so full of hope and those deep themes that change you. Synopsis: As a middle child, Taylor Edwards never felt like a standout, except in all her running away when things got hard. But then her dad gets some terrible, unexpected news and the whole family packs up for a summer spent together in their old lake house. Suddenly, Taylor is surrounded by past memories but this time there’s no where to run. But the longer they are at the lake house, the more she realizes she been gifted a second chance: with old friends, family, and maybe even at love. If you believe in the power of love and hope over grief and heartbreak, this is a must read! Sarah Dessen books have a special place in my heart, none more so than this one. TTAF found me in high school, and since then it’s become one of my favorite stories of all time. I’ve even married my own Wes. ynopsis: Macy has her summer all planned out: her boyfriend Jason would go to brain camp while she stayed home, maintaining his library job and studying for the SAT. But then life throws an unexpected curveball her way when Delilah, Wes, and the whole WISH catering crew enter her life. Especially Wes. Soon, Macy learns that sometimes the things you least expect are the things you need the most. If you want a sweet, make you feel good book with a happy-yet-plausible ending that will encourage you to get out there and live, this is your read. If none of the above stories fit your reading box, then here’s five more I’ve absolutely loved and raved about over the years. After all, we always want summer to last awhile, right so what’s a few more books? Plus, it’s really hard for me to limit a booklist to only 5 reads! There you have it! Five (and then some) reads to get you through the rest of summer. The best part about these books is if you end up hooked, you won’t have far to go. Several of them are the beginning to a series (*) and many of the authors have other stand alone novels that follow along in the summer-y realism genre. Now, the big question is, which one will you pick up first?